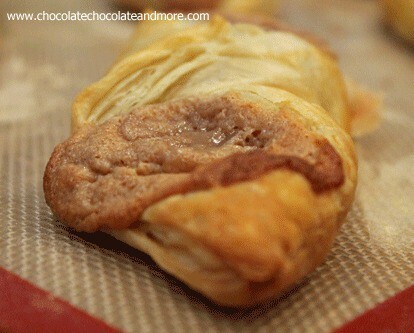 Brown Sugar Cheese Danish - Chocolate Chocolate and More! 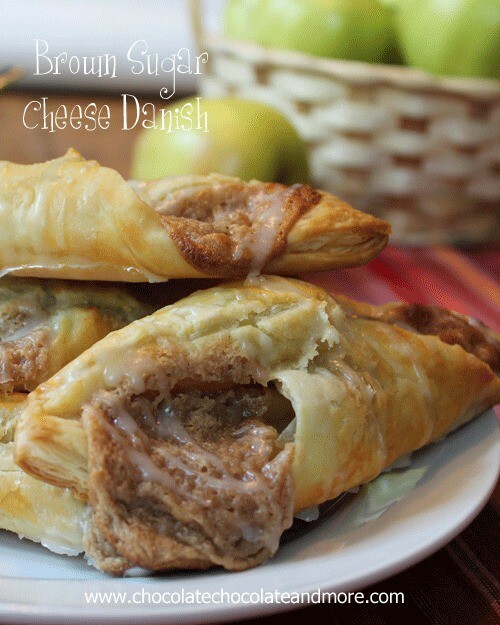 Brown Sugar Cheese Danish, so easy to make, so good to eat! A few weeks ago I shared with you this Brown Sugar Cinnamon Fruit Dip. It’s amazing. I can eat it with a spoon. I make the kids use fruit when they want to dig in, but me, I’m mom, I can use anything I want to get some of this stuff. You know how it gets, you can only eat so much of a good thing and then…enough. Around the fourth batch, the kids, well, they’d had enough. And I’d just made a new batch, for them! I love Puff Pastry. So easy to use, makes simple recipes seem fancy. I always have a box or 3 in my freezer. Kinda like butter, I don’t like to be without it. Perfect for a quick, looks like I slaved over it, made from scratch (we know I didn’t but don’t tell) treat. Sweet or savory, it’s always able to deliver. This recipe is so simple I hate to call it a whole post. But it’s too good not to share. My kids wanted to know what the occasion was for having these. I told them just because I thought they were worth it. And by the way, would you mind picking up your rooms before dinner? I loved having their rooms all picked up without having to nag. Defrost puffed pastry on a lightly floured cutting board. Once thawed, gently roll with a rolling pin, just to stretch dough a bit. 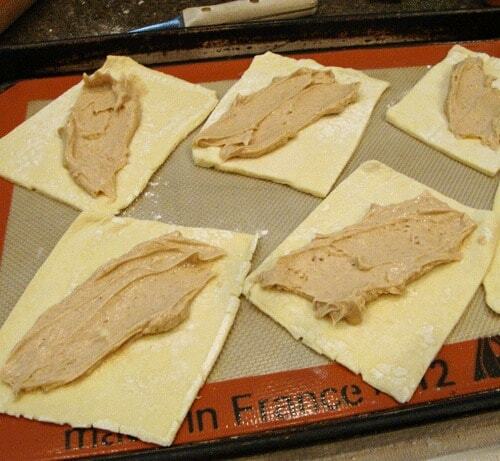 Cut dough into 6 squares. Transfer squares to parchment lined baking sheet. Prepare filling-combine cream cheese, brown sugar, cinnamon and vanilla until smooth and creamy. Spread filling down the middle of your pastry, between opposite corners. Fold empty, naked, the corners that don't have spread on them, into the center, just overlapping. Use just a dab of water to "glue" the corners together. Bake in a preheated 400 degree oven for 12-15 minutes, until golden brown. Combine powdered sugar and milk/cream, stirring until smooth. Drizzle over pastries. Serve warm. Store in air tight container in the refrigerator. 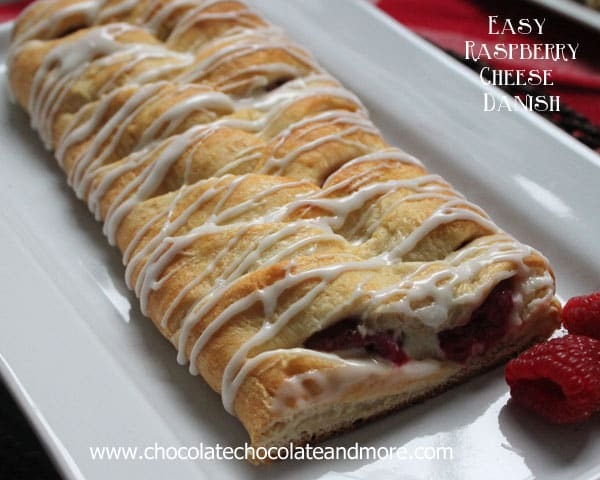 Looking for more easy breakfast treats? I fix the dip for my grands and we all love it to the moon and back. Now, they are gonna LOOOOVE these, too. Thanks so much. Wish i had this right now to go with my coffee for onlineblogcon! Jen, we’re back door neighbors! I’m in Byron. Yes, the Publix, Kroger and Walmart I shop at are all in WR! Depending on where you moved from, you will find we are lacking in many ingredients. I moved here 15 years ago and there are still a few thing I wish the stores carried. So glad to meet you! LOVE brown sugar and LOVE breakfast pastries 🙂 this looks wonderful, Joan! These look incredible, Joan! Love the brown sugar filling! Oh yum! This looks fantastic! I’ve never worked with puffed pastry. I think I should pick up some because this looks like what I should feed the kids on Thanksgiving morning when we all get up! Just flew back from a trip late last night and your post is what I woke up to! I wish I was in your kitchen right now….these look divine! This is a great idea! Especially with the holidays around the corner! Can’t wait to meet you this weekend!! This looks so good – just pinned so I’ll remember to try it, maybe this weekend! Oh, yes. These are for me! They sound SOOO good Joan! This is just screaming my name for breakfast tomorrow…. Thank you so much for linking up to Sunday’s Sweet Confessions over at mommy’s sweet confessions! Have a great day! That looks so so good! Who cares if it is “simple” – it looks so good! I am featuring this recipe on my linky party this week! Thank you for sharing Joan! Hooray! Another reason to buy puff pastry!! Those look delicious! Thanks for sharing at Iron Chef Mom: Cinnamon this week. Good luck! Where is the cheese in Brown Sugar Cheese Danish?? Hi Mildred, the cheese in in the Brown Sugar Cinnamon Fruit Dip, made with Cream Cheese. These look great!! 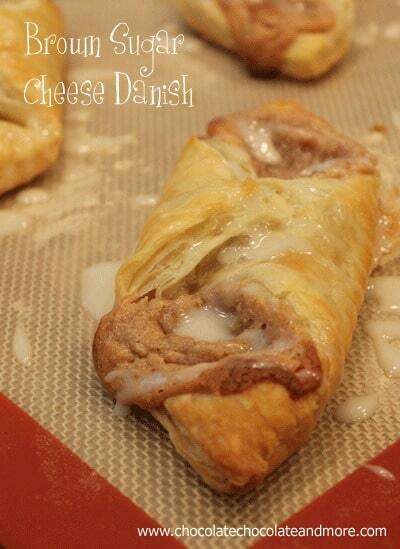 Do you think you could use Pillsbury Cresents? Or would they not have the same effect?? you can certainly use the crescent dough, your texture will be different but just as tasty! Yes powdered sugar is also known as icing sugar or confectioner’s sugar. Is powdered sugar just everyday white sugar? Powdered sugar is also called confectioner’s sugar or icing sugar. This looks delicious! It’s too bad I don’t have time to get to the grocery store to buy the puff pastry, it would take at least 30 minutes to get there and back. I will make and fill crepes with this instead. Using the filling in crepes sounds delicious!